The phases of Charles Darwin’s career have often been defined by the books that he read, from Lyell’s Principles of Geology during the Beagle voyage to Malthus’s Essay on the Principle of Population during his London years. The book that encouraged him to pursue a scientific voyage in the first place was the Personal Narrative of Alexander von Humboldt’s travels in Central and South America between 1799 and 1804. 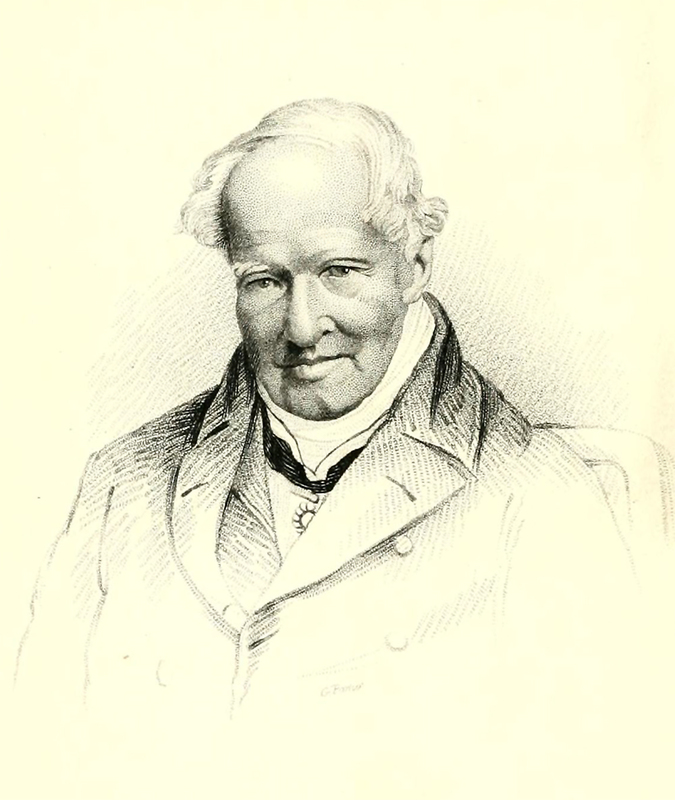 Alexander von Humboldt was a well-born Prussian exponent of a science of earth and life that he called ‘Physique générale’. He was a friend and collaborator of Goethe and his associates in the German Romantic literary and scientific movement, and trained with Abraham Gottlob Werner, Europe’s leading practitioner of mineralogy and geognosy. After working for half a decade as a mining engineer, Humboldt used the wealth from his parents’ estate to finance a five-year trip to the Spanish Americas, where he and his companion Aimé Bonpland scaled the Andes, explored the Orinoco River, and accumulated an enormous mass of data through the enthusiastic use of a staggering load of scientific instruments carried by their porters. Upon returning to Europe in 1804, Humboldt settled in Paris. The expedition generated an endless stream of publications in which Humboldt compiled, analysed, and represented that data in tables and distribution maps alongside prose that urged an aesthetic appreciation of nature. When Darwin was a student at Christ’s College, Humboldt’s Personal Narrative fuelled his first truly grand ambitions. He was captivated by Humboldt’s descriptions of the tropics, which he recited aloud to John Stevens Henslow and his friends while they were examining plants and turning over rocks on their rambles between Cambridge and Grantchester. So strong was Darwin’s desire to emulate Humboldt that after taking his degree he started new studies of Spanish and geology, and began to plan a natural history excursion to Tenerife, where Humboldt had stopped on his passage to the Americas. He only finally set those plans aside when he was presented with the opportunity to join the Beagle. Darwin’s Beagle manuscripts reveal that he absorbed much more from Humboldt than an industrious spirit and a Romantic conception of nature. He used the Personal Narrative and Humboldt’s writings on Asia as omnipresent sources of facts about topics as varied as the migration of birds, the average slope of a volcanic cone, the temperatures of seawater, the hibernation of crocodiles, and the geography and mineralogy of locations from the Cordillera to Central Asia. A review of the citations given in the ‘little notebooks’ that Darwin filled on the voyage and after suggests that Humboldt’s influence on Darwin’s thought was eclipsed only by that of Darwin’s father and Charles Lyell. Less obvious, but no less profound, are the concepts and theories that Darwin learned from Humboldt’s works and applied for himself. Darwin’s oft-expressed obsession with the distribution of plants and animals, for example, and his fascination with the altitude (and submarine depth) where he found his specimens, echoed themes so central to Humboldt’s work that a citation would have been redundant. Humboldt, Alexander von. 1814–29.Personal narrative of travels to the equinoctial regions of the New Continent, during the years 1799–1804. By Alexander de Humboldt and Aimé Bonpland.Translated into English by Helen Maria Williams. 7 vols. London: Longman, Hurst, Rees, Orme, & Brown; J. Murray; H. Colburn. Describes his appointment, theBeagle, his companions, and the objectives of the voyage. Gives his schedule before departure. Sends queries on Galapagos flora in particular and island floras in general; also on relationship of wide-ranging species to wide-ranging genera. Prussian naturalist, geographer, and traveller. Official in the Prussian mining service, 1792–6. Explored northern South America, Cuba, Mexico, and the United States, 1799–1804. Travelled in Siberia in 1829. Foreign member, Royal Society of London, 1815. This text is adapted from 'Darwin and Humboldt' by Alistair Sponsel (in Alison M. Pearn ed.,A voyage round the world, Cambridge University Press 2009, pp. 13–15.